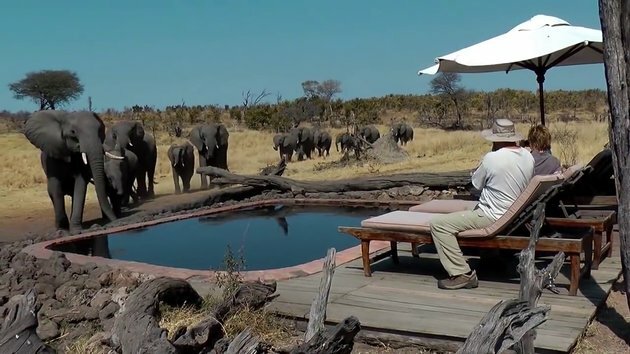 An amazing moment is captured on camera when a herd of wild elephants drink from a pool in the Somalisa Tent Camp in Hwange NP, Zimbabwe. What a sight to see! wish I could afford to take a trip to experience this ! #1 Ah look you just saw it on Snotr, saved yourself a fortune, didn't get bitten by mosquito's, didn't have to have the vaccinations, didn't risk being eaten by a lion, real life is so over-rated. You can notice from the video how pool water level has gone down after all elephants got drink. #3 Well feck me, it's a miracle. Eat your out, King Leopold II!